The Ramblers, a beautiful and distinctive detached Grade II listed home, combines a 17th century cottage and an old Victorian school, the whole providing a unique home of great character, with flexible accommodation over three floors, set within the heart of this most desirable village in the Hambleden valley. A stone path leads to the front door through a cottage garden that in high season is a stunning riot of colour. Entering the cottage, the character is immediately evident with exposed wall and ceiling beams found throughout. The sitting room, with an inglenook fireplace and bread oven, has distressed smoked oak flooring continuing into the garden room where French doors open onto the rear garden. Opposite the sitting room is the dining room, with a Cornish slate floor and open fireplace. The oak flooring continues through an inner hall into the Victorian part of the property where a stylish modern kitchen with integrated appliances is located at the garden end with a door providing access to the garden. The old school hall is an impressive space, with vaulted ceiling, exposed timbers, and lattice lancet windows, sympathetically architecturally renovated in 2010, creating a flexible entertaining area presently used as a music room. Within the hall there is a cloakroom beneath the stairs that lead up to the mezzanine, currently a small lounge which can be used as an office or a guest bedroom, where a latticed circular window provides views over the countryside. There are two delightful bedrooms located on the first floor of the cottage where the theme of exposed wall and ceiling timbers continues. A bathroom with both bath and shower serves both bedrooms as well as the third bedroom on the second floor. Opposite the third bedroom is an attic room that is used as a store room. 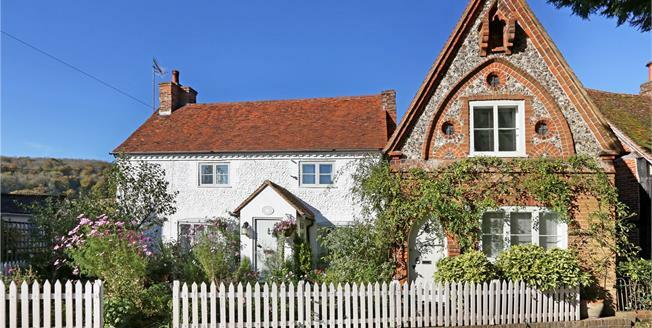 Skirmett is a picturesque rural hamlet set high up in the Hambleden valley, in a designated Area of Outstanding Natural Beauty. The nearby local pub, The Frog, is well regarded for its food. Henley, Marlow and High Wycombe are all about 7 miles distant, with excellent shops and schools for children of all ages, both in the public and private sector. There are good rail services to London from High Wycombe (now about 23 minute service to Marylebone), Henley, Marlow, Maidenhead and Reading. Easy access to the M4 and M40, together providing links to London, Oxford, the Midlands and the West Country. Opposite The Ramblers is a double garage with a boarded loft providing excellent storage space with an attached workshop at the rear. The front garden is bounded by a picket fence. From the charming rear garden there are stunning views over open countryside and a low-set brick and flint wall bounds the garden within which a stone path meanders through carefully positioned and well stocked flower beds. There is a gardener’s toilet attached to the rear of the house which also houses the boiler. Local Authority: Wycombe District Council.